When it comes to selecting the best website builder to come up to a variety of needs, uKit and Wix are definitely worth close exploration and consideration. The platforms are powerful, full-featured, customer-oriented and affordable for everyone. They come with WYSIWYG and drag-and-drop tools to ensure maximum ease of use and convenience for people with various web design background and experience. At the same time, there are multiple features that distinguish the services from each other and make them stand out from the crowd in their own niches. This is what makes the comparison of these two industry leaders interesting and useful for the prevailing amount of users searching for a decent tool to work with. 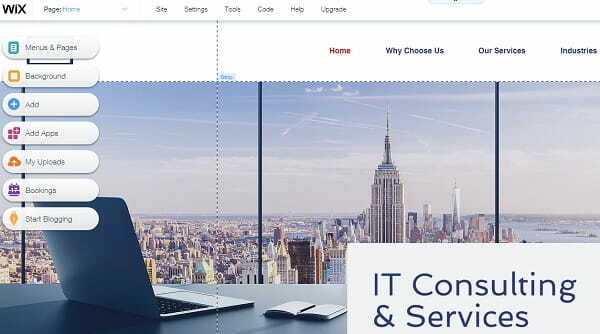 uKit – is a small business website builder, which is known for its ultimate simplicity and affordability. You won’t find such a feature-laden website builder available at such an amazing and cost-efficient price. You can initially use the system to launch and manage websites for entrepreneurs, but it is also possible to create other types of websites with it. Wix – is the most popular, user-friendly and functional website builder available in the modern web design industry. Its powerful feature set, abundance of templates and customization tools make the system a worthy choice for users with zero web design skills and insufficient knowledge. We think it’s a good idea to compare Wix vs uKit as both of them are in the top of their niche segment and share a similar approach to website building. At the same time, they feel differently, and the end result – a created website – is different as well. So, which of them is the best option for you? Mind that we don’t make it our goal to set one platform above the other. Each website builder has pros and cons. The services have many differences, so there is much to compare. Let’s finally dig in. uKit. uKit is a decent website builder, the sphere of application of which mainly goes down to the development of websites for small and medium businesses. Landing pages, portfolios, blogs and websites created with the system are also worth the attention. What’s important, the website builder is meant for users, who don’t have a single idea of how to create websites yet wish to get quality projects to establish business web presence. The service has a simple and intuitively understandable dashboard, which looks modern and is easy-to-navigate. The drag-and-drop editor of the system makes it possible to easily customize any template in no time and apply all the required settings (view visitor statistics, connect analytics, get promotion tips, activate ‘under construction’ mode, view notifications, upload a favicon etc.). Whether you intend to integrate a widget into your website, add or delete the pages, create new posts, connect a custom domain or complete any other action, doing that with uKit will be a pleasure. The website builder comes with a logically-structured interface. Apart from the dashboard, there is the Builder section offering three working areas, namely Site Pages, Design and Builder itself. Even if this is the first time you work with the system, you won’t get lost here. Users will additionally appreciate an opportunity to preview the current version of their website, which is under construction. This can be done on any stage of the web design process to control it and be able to make the edits prior to final project publication. The preview option lets you see the way your website looks in desktop, mobile and tablet modes. Wix. The website builder features exceptional ease of use for all categories of web developers, be it a non-techie, who sees the platform for the first time or a web design pro with years of niche experience. The system provides an extensive selection of tools, services and features needed to design different types of projects, including business websites, portfolios, landing pages, online stores, blogs etc. 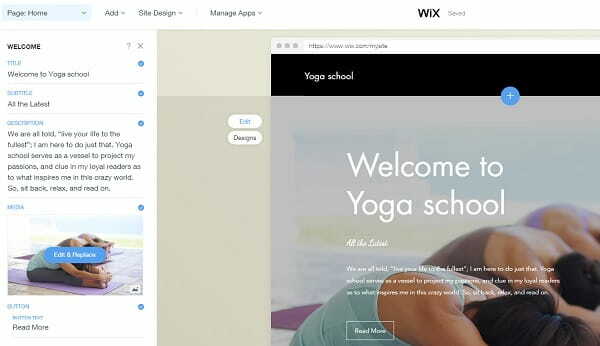 Wix ensures easy website navigation, convenience, safety and intuitive web building nature. The interface of the system is well-structured, while its dashboard is simple enough to grant access to all the required sections. There is no need to be a web design professional to get used to it – just watch the tips and take your time to explore the system to start working with it. Wix has a convenient WYSIWYG website editor that comes along with a drag-and-drop tool to provide simple navigation and let you take control over each step of the web design process. Non-techies appreciate an opportunity to watch the changes they make as it lets them correct the mistakes on time. The website builder makes it possible to apply various effects upon the website elements, make use of Parallax Scrolling feature, add and edit content (texts, images videos etc. ), integrate media files, select and edit backgrounds and fonts and perform other multiple actions with no special hassle and waste of time. uKit vs Wix. The website builders have similar focus as both of them work well for users with different web design skills and background. They are understandable and easy-to-use right from the start and there is no need to possess programming skills to explore the platforms to start building websites with them. Thus, we can rightfully call uKit and Wix simple, convenient and intuitive website builders that work great for everyone. uKit. uKit’s functionality is worth separate attention. The website builder comprises multiple widgets that can be easily integrated into your website to give it the required performance. The widgets available in the dashboard are dragged onto a page to be further arranged as you need. You can also customize them to add the content that matches your website specialization. The number of widgets the system offers is really impressive, which extends your website functionality. These include Google search, live chat, product cards, social bar with popular services, news informer (or a blog, in other words), audio player, callback order, slider, price list and more. It is also possible to use ready made block combinations that make it easy to complete a certain task (these are header/footer, products, specifications, portfolio, contacts, reviews and more). Apart from standard widgets, uKit offers a set of specific widgets that can be applied for web store creation or the development of other websites. These include uCalc (online calculator), Timeline, Steps and what not. There are more than enough tools to create a superb business site or landing page in uKit. The system is devoid of the unneeded elements to let you use only those tools and features you need most. Right after you sign up for the service, you’ll be offered to select a template, a 3rd level domain name (for temporary use) and start customizing the project. There is nothing complicated about that – just follow the steps and tips the system generates to complete the stages with ease. Take your time to experiment with backgrounds, colours, fonts, blocks, widgets and available tools or elements. The entire process of website development won’t take it longer than half an hour or even less, depending upon your skills. uKit comes with powerful blogging and eCommerce engines. As mentioned above, the blogging option is realized through the integration of the News Informer widget. To launch and successfully manage a blog, you may add and update posts, create blog topics and modify the existing ones. Scheduled news publication option makes it possible to set up the date and time, when the written posts will be automatically published. This is very convenient, when you plan the vacation, for example, or just know that you won’t have access to the Internet, but wish to provide readers with information they are waiting for. uKit eCommerce options are versatile as well. The system provides two ways to launch an online store. The first one implies the connection of the eCommerce widget, while the second one allows integrating your Ecwid account (if you have the one) into the existing website. It’s up to you to select the most suitable variant based on your eCommerce needs, preferences, budget and the result you wish to avail in the long run. uKit also excels at SEO website promotion features. 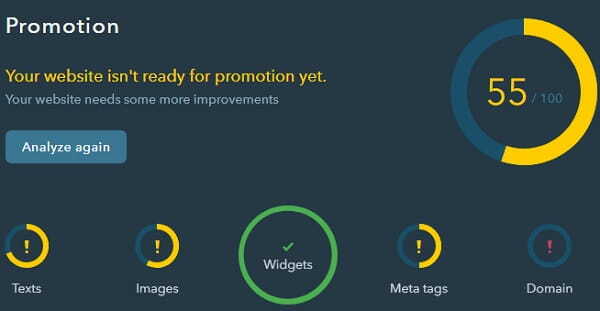 By filling out the meta tags for all pages, synchronizing Google Analytics with your account and checking the statistics, you’ll be able to track and manage the promotion strategy of your project with maximum efficacy. The system also allows connecting SSL Certificate to ensure higher security level and prevent your website data from scammers and hacking attacks. Connection of the SSL Certificate to your domain is free. If you plan to work on your website development with a team of co-workers, uKit allows granting website management access rights to all the members you intend to work with. Mind that the main right holder will have access to the payment and billing information, while other users, who share the web design access, will be able to perform the rest of the actions, but they will be devoid of payment info access. This is done to ensure maximum website security. In case of shared website access, the system will automatically create the backup copy of your website to prevent accidental content loss. As a right holder, you’ll be able to cancel shared website access any moment, but keep in mind that the overall duration of temporary team access won’t last longer than 999 days. In most cases, this is more than enough to launch a full-featured website with uKit. Wix. The website builder is known for its advanced feature set that cannot even be compared to that offered by lots of other niche representatives. Wix comes with an extensive selection of features, apps, tools and add-ons to help you get the most out of website design experience. Being initially focused on the skills and needs of beginners, the system lets them choose the preferable website editing mode. Web design pros usually give preference to the Standard Wix Editor as it enables them to manually customize their projects, making use of the available tools and features. Standard Editor doesn’t differ a lot from those available in other such-like systems. What you need is to select the template, reach the dashboard and start customizing it with regard to your project specialization and business objectives. 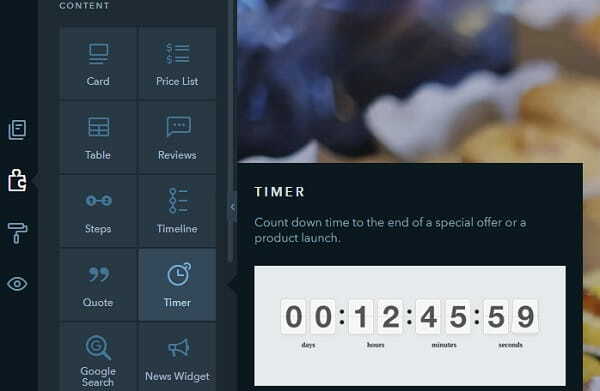 The second option is using Wix ADI – the advanced website editor, which applies the Artificial Intelligence technique to automatically create a website for you, using the website-related info you previously submit. When building a website with Wix ADI, you’ll spend a couple of minutes only – the result won’t keep it waiting. This is what makes this web building option a great choice for beginners. 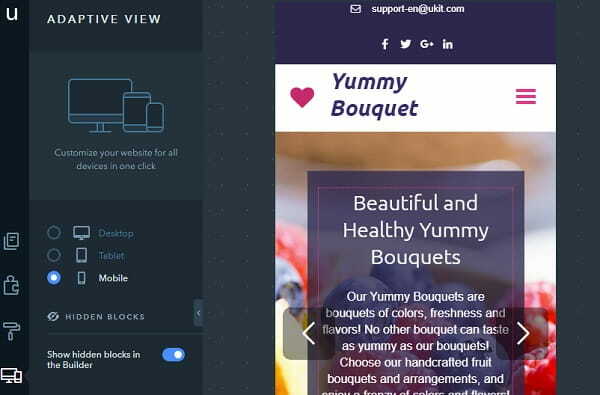 If you wish to make your newly-designed project mobile-responsive, the system offers a Mobile Editor that lets you set up and modify the mobile version of your website. The important nuance is that you can make any changes in the mobile mode, but they won’t be visible in the desktop version of your website. At the same time, all the edits made in the desktop project mode are immediately displayed in the mobile version. That’s very convenient for users, who browse websites on the go and wish to stay aware of all the website updates on time. Wix boasts powerful blogging and eCommerce engines allowing to build these types of websites, using a variety of niche-specific tools. What’s more, the platform frequently provides discounts, special offers, coupons codes, gift certificates, sales options and other opportunities for effective management of advertising and promotion campaigns. See also: How to get your Wix website found and ranked well on Google. uKit vs Wix. Wix claims to be a multipurpose platform, and this is justified to a certain extent. uKit is easier to handle in terms of the Dashboard structure and content management, but it lacks the diversity of additional features and offers only essential tools for beginners to quickly create a website. Wix is brighter and more interesting, while uKit is more practical. With the latter, the chances to achieve positive results are higher as there are fewer means to crumble the website. On the other hand, Wix grants a fuller control over your online presence. uKit. The website builder boasts extensive template collection. As of today, the number of themes exceeds 400 and all of them are subdivided into 40 niche topics to come up to various thematic preferences and company specialization. Whatever business you run, you’ll certainly find a suitable template here. All the themes are responsive and suited to all kinds of devices and screens, so, there is no need to create a separate mobile template. With a full-screen preview of each design, it’s really easy to choose one. The quality of designs is high: they are modern, neat, and filled with quality industry-specific demo content. The downside is that many of them have similar structure and layout. However, all of them look professional and impressive. What you can do to customize the templates is to set up, arrange and delete ready-made content blocks it is comprised of, edit fonts, colors, menu sequences, slider images and other structural website elements. Mind that each template comes with pre-designed demo content and may be changed on any stage of the web development process in case of necessity. To improve the mobile browsing experience of website visitors, uKit allows setting up its tablet and mobile modes. If you don’t wish some blocks to be visible in the mobile mode, you can hide them in the corresponding menu section. What’s important, the mobile version automatically synchronizes with the desktop website mode. Additionally, uKit offers an opportunity to develop a separate website version for visually-impaired users. This doesn’t require any special skills and it’s generally done with a few clicks. The option is available in the “Design” section and is of great help for users working on the development of educational websites or projects for governmental institutions. Wix. Wix somewhat prevails over uKit is terms of template quantity, quality and customizability. The number of themes available in Wix template collection currently exceeds 550 designs, with new high end themes being added on a regular basis. Wix templates are also subdivided into thematic categories based on the topics they belong to. The templates look professional and are mobile-ready to match various screen types. Template customization options are more extensive as compared to those offered by uKit. There is much you can edit here by reaching the system dashboard – fonts, backgrounds, titles, footer, header, general design settings, animation effects, buttons and more. This is due to the platform’s peculiarities: the designs are extremely diverse in layout, and it would be impossible to fit the existing content into a new structure. That’s the price you pay for a versatile design collection. The dashboard of the service provides multiple design options. However, get ready to invest some time to explore the system’s potential to the advantage and get the most out of using it, when working on your website development. uKit vs Wix. 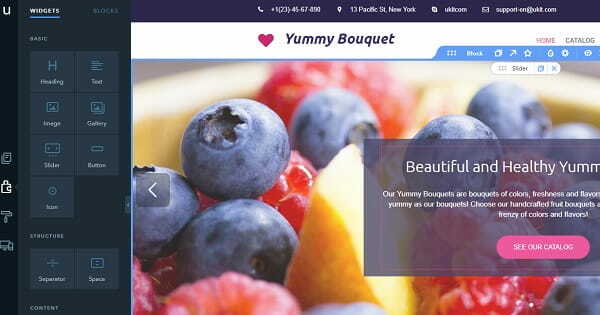 Wix templates are artistically crafted and it is captivating to work with them. The themes are mobile-ready, professional and 100% customizable to come up to the needs of multiple user categories. Their current number exceeds 550 themes, while the service developers keep working on the creation of new themes. uKit also offers multiple categories and pre-set industry-specific quality templates, although, their number is lower than that provided by the competitor. uKit also unveils an opportunity to develop a website for visually-impaired users. This is also a notable advantage. All in all, Wix templates are more interesting, while uKit ones keep up with high industry standards. uKit. The customer support of the website builder is on a decent level. Its powerful Knowledge Base allows users finding out special system details to discover its full potential. Help topics are divided into thematic categories based on the issue they refer to. What’s more, the system grants access to multiple articles, which provide up-to-date information about the principles of working with the system as well as about the web design process in general. If you need an immediate support, there is a Skype help available 24\7. You can also send a ticket via email. Wix. The major focus of the system on non-techies explains the flexibility and informational value of tutorials, articles and guides Wix has in stock. Whatever unknown element you come across when working on your project, you may hover a mouse over it to see the tips on its implication and further use. There is the informative FAQ section and a forum with multiple topics, categories and subcategories, where each user may come across topics, inquiries and tips that can effectively help solve their web design problems. The search filter option contributes to time economy and maximizes chances for success. There is also email support and opportunity to access and communicate with the Support Center via phone to have all the questions answered. uKit. You won’t find a free never-expiring plan for uKit users, but there is a 14-day trial that is enough to test the entire set of the system features at no cost at all. If you are satisfied with the range of services provided, you’ll be offered to choose one of the paid plans. There are four of them here and the prices range from $5/mo ($48/year) for the cheapest subscription and up to $15/mo ($144/year) for the most expensive offer. The cost of the plan selected may be notably reduced, if you decide to pay for 3, 6 months or even for 1-2 years at once. In this case, you may get a discount of 5-30 % depending upon the payment option selected. Wix. Wix pricing policy is more than affordable for everyone, who is interested in professional DIY website development. The website builder has a free plan, which does not expire when using it for the unlimited period of time. This is a good chance for Wix users to test and explore all the features, tools and advantages of the service. Awareness of the system features will make it possible for users to choose between the available paid options. The cost of the paid plans extends from $4.50/mo for the most affordable plan and reaches up to $24.50/mo for the most costly solution. All users, who have an intention to use the system on a regular basis, should be aware of the fact that the service frequently offers discounts, coupon codes, special offers and other loyalty suggestions that make it possible to save big (sometimes even up to 50%) without loosing an opportunity to use all the system advantages. uKit vs Wix. Both website builders offer affordable plans and variety of pricing options to come up to various preferences. Unlike Wix, uKit doesn’t have a completely free subscription, yet it offers more pricing plans available at cheaper cost. In fact, uKit is rightfully considered the most affordable website builder for business website creation and it really has grounds to win this “title”. Wix prices, in their turn, are quite flexible as the system frequently offers discounts and special offers to cut down the cost of subscriptions for newcomers and registered users. uKit and Wix are the most well-known, feature-rich and affordable website builders focused on the needs of various users categories. Ensuring ease-of-use and convenience, the system works equally well for non-techies and website developers with years of industry experience. Each of them, however, has a set of features and tools that make them stand out from the crowd. uKit is a small business website builder, the area of specialization of which centers around small business website creation. The service is simple and intuitive for newbies and web design pros, yet its pricing policy is more than affordable for any user, not to mention the entrepreneurs, who have long-term goals. Wix is the all-in-one website builder, which currently holds high positions in professional website development. The system stands out from the crowd due to its flexibility, high potential and web design perspectives, powerful feature set, quality templates and multiple tools meant for different user categories. Despite the seeming similarities, there are a number of fundamental differences between Wix and uKit. In a nutshell, uKit is more suitable for a quick launch of a promo website for business. It is also more cost-efficient. Wix will mostly appeal to those users, who wish to gain out-of-the-box results by manually fine-tuning each element of the website. This is a builder for creative professionals. Thus, both services are good for the audiences they target. Both of them deserve the attention. Even though, Wix has been in business for a longer period of time and features more powerful web design perspectives, uKit has much to offer to users, who are looking for new design alternatives. uKit and Wix are decent competitors and you have to test both of them prior to making the final decision.